With my gdaughter's birthday closing in, I have devoted all my knitting time to her sweater. I finished the sleeves, more or less. They are knit in the round using DPNs, no problem there, but they are then to be set in. I have never done set in sleeves before, so this should be interesting, plus a pressing reason to get the rest of the knitting done in a timely manner, to allow for do-overs. Originally, I started the body on circular needles, but when I had to start the body over, I switched to straights, the better to cable with. I eschew using a cable needle (using this technique - scroll down) and find it easier on straights. The pattern is not difficult, but for some reason I cannot do anything else while knitting it - no audio books, no TV - without messing up. Consequently, this project is relegated to the home front. Needing something portable, I started gdaughter's xmas socks, using the same yarn as the ones for her mom. And because my purse was too cramped for carrying even small knitting projects, I just had to buy a new one. The designer is Donna Sharp. Not only are her purses attractive, they have lots of pockets inside and out. And this style has room for a bit of knitting. The Easy as Pie blanket notwithstanding, I decided my next knitting project should be a sweater I have been dying to knit for *years*. It's not for me, but for the granddaughter, who turns four next month. Since the sizes for the pattern go up to only age 5, there is not much time left. So off I went. The Tuckernuck Cardigan has cables, and there began my troubles. 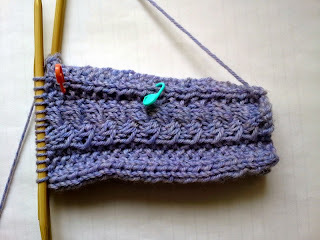 Cable stitches pull in, so how does one measure gauge? I made a halfhearted attempt at swatching, then dove in on knitting the body. There arose another problem: despite the swatching, my gauge felt too tight however it was measured, due no doubt to my still relatively new devotion to using the Irish cottage (lever) knitting technique. As I knit along, I kept telling myself the usual lies we knitters tell ourselves when something is not going quite right, one of which is "I can fix this with blocking." Then I remembered I had deliberately chosen a superwash yarn as my daughter is known to wash the bejesus out of everything, felting even the unfeltable. With this in mind, I eventually came to the conclusion I should knit looser. So I started anew, on a sleeve (which first involved a trip to Joann - not my favorite store - for some US9 DPNs). Actually, I prefer to start sweaters with the sleeves, to avoid the dreaded one-sleeve syndrome that tends to occur oh-so-close to the end of a sweater project. I also performed an experiment on a sweater of my own, one knit in Wool-Ease. The fabric felt too loose, so I machine washed it (on the gentle cycle), then put it in the dryer. That did tighten up the fabric without sacrificing the size. I am hoping the same will occur for Tuckernuck. A side note: I wish I had chosen the Karabella yarn the pattern called for, as it has better stitch definition than Cascade 220. My usual source for this elusive yarn no longer sells it, though, plus I was literally at Webs when I selected this lovely lavender that seems perfect for a little girl. Oh, well! While visiting my dad in the hospital, I knitted socks. My sister-in-law gushed over them. I never know what to say when someone does this, especially when what is making the knitted item so special is not the knitting but the yarn. In this particular case, the knitting was as plain as can be, but the self-striping nature of the yarn provided a very pleasing result. All I contribute is an OCD-like persistence. At least she did not ask me to knit a pair for her (although I just might). Pattern: None really, just Turkish cast on, 52 stitches around, gusset heel, taller than usual for wearing with boots, Jeny's Surprisingly Stretchy bind off. I didn't try to match the stripes this time other than start at the beginning of a color run so the striping at least lined up. For winter socks, these colors are surprisingly summery looking, like watermelon. Hopefully, there is enough yarn leftover for a pair for my granddaughter; then she and her mom will match.